48% of Connacht people have not visited their dentist in the past year, highlighting need for focus on dental hygiene. Pictured are Arona Romeri aged 5 and Ireland and Munster Rugby legend Alan Quinlan as DeCare Dental Insurance Ireland releases research into Ireland's dental habits to celebrate the launch of 'Healthy Smiles' and 'TeamCare' dental insurance plans Pic: Marc O'Sullivan. New research conducted by DeCare Dental Insurance Ireland shows that 48% of people in Connacht and parts of Ulster have not visited their dentist in the past year, which can lead to a detrimental effect on teeth and oral hygiene1. The main reason for the decline in dental visits is due to cost, with 58% of Connacht/Ulster people not attending the dentist more often due to cost1. This research was conducted by DeCare Dental Insurance Ireland, Ireland's only dedicated dental insurer, who launched ‘Healthy Smiles' and ‘TeamCare' dental insurance plans, the first directly available range of individual and corporate dental insurance plans for Irish customers. To mark the launch, Ireland and Munster Rugby legend Alan Quinlan has teamed up with DeCare Dental Insurance to raise awareness of the importance of a healthy smile. While the research demonstrated poor dental hygiene habits, the majority of people did recognise the significance of good dental hygiene. 86% of Connacht/Ulster respondents thought that bad teeth would impact on their success in a job interview, while 87% of Connacht/Ulster people said that unhealthy or unsightly teeth would put them off a new partner1. However, the cuts in tax relief and PRSI for dental care has led to a significant reduction in people attending the dentist with one in four people claiming that they visit the dentist less now as a result2. The Healthy Smiles range of plans from DeCare Dental Insurance offers on an annual basis dental exams, dental cleanings, emergency treatment and significant contributions towards procedures such as fillings, extractions, root canal, dentures, crowns, inlays and onlays. The insurance also provides orthodontic benefits to cover items such as braces depending on the level of cover that is chosen. 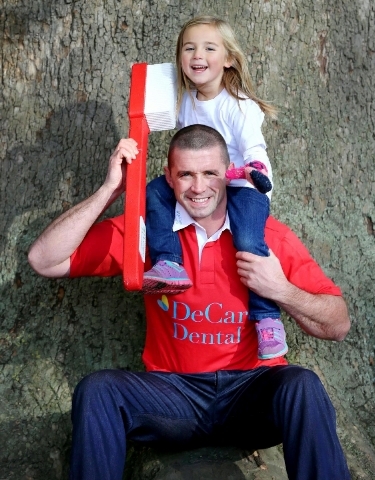 Pictured at the launch were DeCare Dental Insurance ambassador Alan Quinlan with Arona Romeri age 5. Pic: Marc O'Sullivan. Whilst overall numbers with health insurance cover are declining, DeCare's experience shows there is growing interest in purchasing dental insurance, with increasing sales volumes and increased claims utilisation over the past year demonstrating more regular attendance at the dentist amongst the insured population. For the past ten years, DeCare Dental Insurance Ireland has partnered with Vhi to provide dental insurance, with DeCare providing the product, customer service and claims management, but now for the first time the company will offer its insurance product directly to the wider general public. Maureen Walsh, CEO, DeCare Dental Insurance Ireland commented "DeCare Dental Insurance is delighted to directly offer Irish customers a cost effective remedy that aims to take the financial pain out of good dental hygiene. As part of a leading global insurance family, DeCare Dental Insurance will offer a unique service to the Irish market. Throughout the year customers can experience financially beneficial dental care including check-ups, cleaning and x-rays as part of DeCare's dental service, as well as cover for minor and major treatments." Commenting on the findings, Dr. Ger Gavin, Chief Dental Officer, DeCare Dental Insurance Ireland said, "Research has shown that Ireland's dental health is not being prioritised as per recommended national and international guidelines, mainly due to cost, which will result in long-term damage. The removal of PRSI cover and tax breaks for dental care has also meant that one in four people attend their dentist less often, leading to a further gap in care. DeCare Dental Insurance offers a cost effective and financially sustainable solution to this problem which is affecting a large portion of Ireland's population. Research has also shown that Irish customers with dental insurance are more likely to attend the dentist. developing a regular oral health routine which has long term benefits to one's teeth and wider oral health." Alan Quinlan, DeCare Dental Insurance ambassador said, "When I played ruby professionally, I regularly had incidents that involved my teeth when on the field. A lot of us took precautions by using a mouth guard but regular visits to the dentist have always been an important part of my health regimen. I visit the dentist twice a year and a DeCare dental insurance policy is a great way to ensure that you visit the dentist frequently, while also helping to cover the cost of any procedures that might be needed." With annual prices starting at €108.60 for adults and from €74.64 for children for Healthy Smiles Level 1 Plan, the insured person can instantly avail of the product by visiting their dentist for a thorough examination and clean at no cost. In addition, until February 28th children aged 18 or under can avail of a half price offer, with prices starting from just €37.32 per year for Healthy Smiles Level 1, representing great value and long term benefits. For full details on the range of dental insurance plans available please visit www.decaredental.ie or call 1890 130 017.